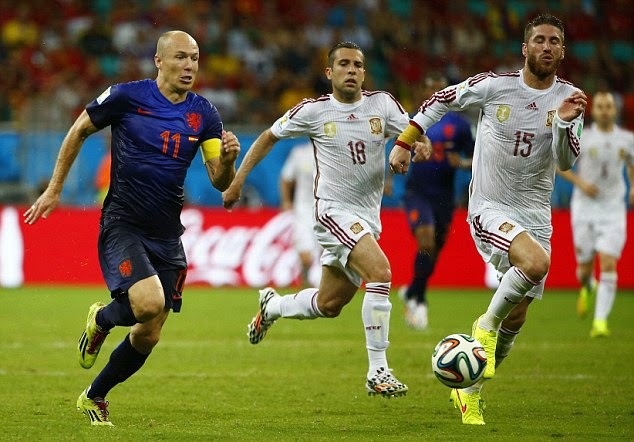 History Creator Arjan Robben became the fastest footballer in the history of Football after rapid sprint against Spain at 2014 World Cup when he clocked up top speed of 37 kilometer per hour. 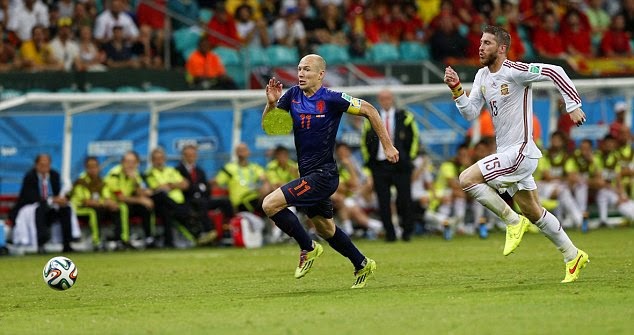 The Real Madrid defender was left trailing in his wake as Robben stormed through; it appeared Ramos was leggy, only for FIFA statistics to later reveal that the 37km per hour sprint was the fastest ever recorded by a footballer. Iker Casillas could then only watch as the Dutchman danced beyond him to score his second sumptuous goal of the night. But while the finish was perfect in its execution, the foot race preceding it was even more impressive. Robben chased on to a ball from his own half, always half a yard ahead of Ramos, before finessing to slot beyond the goalkeeper. 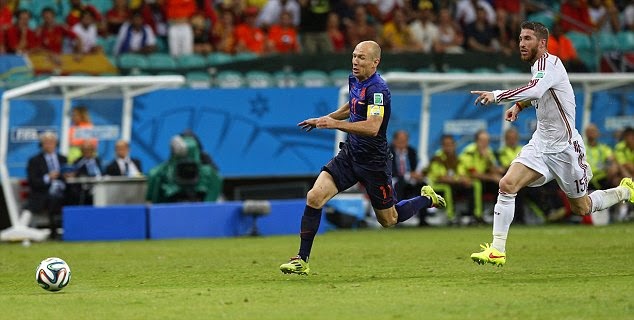 Professional runner and Olympic gold medalist Usain Bolt can cloack upto 44kph and Arjan Robben reached top speed of 37 kph in the spain game making him the fastest player in the history. His previous best was in Bayern Munich shirt when he reached 30 kph speed. Before him the crown of fastest footballer was with 30-year-old Theo Walcott's 35.7kmph, while other notable names in include the likes of Ronaldo, Messi, Rooney, Bale, Aaron Lennon and Manchester United winger Antonio Valencia.